It is said that one of the most important skills a physicist needs is the ability to quickly make “back-of-the-envelope” calculations. For example, Jan Wolitzky (in Jon Bently’s Programming Pearls) tells about Enrico Fermi, Robert Oppenheimer, and the other Manhattan Project brass who were behind a low blast wall awaiting the detonation of the first nuclear device from a few thousand yards away. Fermi was tearing up sheets of paper into little pieces, which he tossed into the air when he saw the flash. After the shock wave passed, he paced off the distance traveled by the paper shreds, performed a quick “back-of-the-envelope” calculation, and arrived at a figure for the explosive yield of the bomb, which was confirmed much later by expensive monitoring equipment. But expensive monitoring equipment which can confirm the calculation does not always exist, and hence in some fields, our entire knowledge is based on back-of-the-envelope calculations and rough estimates. Take, for example, the following question: “How many intelligent civilizations, capable of radio communications, currently exist in the Milky Way galaxy?”. The worthwhileness of search projects (such as SETI) is closely related to the answer to this question. The number of positively known civilizations is exactly one: the human civilization. And yet, many scientists believe, or at least believed until recently, that the actual number is far, far higher. This belief was based on various estimates, such as the calculation proposed by Frank Drake, now known as “The Drake Equation”. This equation was popularized in Carl Sagan’s remarkable TV series, Cosmos. Sagan himself believed the calculation’s result, and was one of the founders of SETI. Drake’s equation is easy to understand. Take the number of stars in the galaxy (about 200 to 300 billion, based on generally accepted estimates), and multiply it by: the percentage of stars that are similar to our Sun in the energy output and stability; the percentage of stars that have planets (since not every star has any); the percentage of planets orbiting their star in a proper distance (so they could hold liquid water, a necessity for maintaining life); the percentage of planets with liquid water on which life actually evolved; and finally, the percentage of life-bearing planets in which intelligent civilizations (i.e., those that can communicate by radio) eventually came to be. All in all, there are five or six factors in this product. But what values should be used for the various percentages? Drake (and Sagan) chose what they considered to be a conservative approach, and estimated that only about 1 in 10 stars has any planets; only 1 in 10 planets is in the proper orbit, and so forth. Despite the conservative approach, the results were encouraging, indicating that there are thousands of intelligent civilizations in the Milky Way, and probably millions of them in the whole universe. Thus they concluded that there is intelligent life out there, in all likelihood; now we only have to look for it. In their book Rare Earth, published by Copernicus Press in 2000, Peter Ward and Donald Brownlee point at Drake’s (and other physicists') mistakes in a long and depressing discussion, a discussion that took the wind out of more than one SF author’s sail. 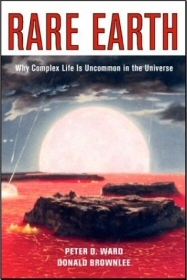 The book presents what the authors call “the rare Earth hypothesis”: simple (bacterial) life is very common in the universe; complex life (multi-cellular life forms, or animals -- let alone intelligent life) is very rare. The first part of the hypothesis is easy to understand, and few scientists will argue with it: indications of simple life were already discovered on rocks originating on Mars, and even here on Earth in conditions that were, until recently, considered completely hostile to life (such as temperatures higher than 100 degrees Celsius, in which 'extremophile' bacteria were found to exist). The second part is the interesting one, and it suggests that the existence of simple life does not necessarily lead to the evolutionary development of complex life, for any number of reasons. Drake’s mistake was basically in the assumption that all it takes for a planet to develop life is being in the proper distance from a proper star. The truth, Ward and Brownlee suggest, is that we have to look at each and every attribute of Earth, and re-estimate its importance for supporting life. Drake’s equation is a statistical calculation, but with no other example for life, we’re doing statistics with N=1. Well then, what are the special attributes of Earth that we have to take into account when attempting to run this calculation? Proper distance from the star. If a planet orbits its sun too closely or too far away, liquid water would not exist. There isn't much margin for error here: a change of 5 to 15 percent in Earth’s distance from the Sun would lead to the freezing, or boiling, of all water on Earth. Proper distance from the center of the galaxy. The density of stars near the center of the galaxy is so high, that the amount of cosmic radiation in that area would prevent the development of life. A star of a proper mass. A too-massive star would emit too much ultra-violet energy, preventing the development of life. A star that is too small would require the planet to be closer to it (in order to maintain liquid water). But such a close distance would result in tidal locking (where one face of the planet constantly faces the star, and the other always remains dark -- as with the moon in its orbit around Earth). In this case one side becomes too hot, the other too cold, and the planet’s atmosphere escapes. A proper mass. A planet that is too small will not be able to maintain any atmosphere. A planet that is too massive would attract a larger number of asteroids, increasing the chances of life-destroying cataclysms. Oceans. The ability to maintain liquid water does not automatically imply that there will be any on the planet’s surface. It looks like Earth acquired its own water from asteroids made of ice that crashed here billions of years ago. On the other hand, too much water (i.e., a planet with little or no land) will lead to an unstable atmosphere, unfit for maintaining life. A constant energy output from the star. If the star’s energy output suddenly decreases, even for a relatively short while, all the water on the planet would freeze. This situation is irreversible, since when the star resumes its normal energy output, the planet’s now-white surface will reflect most of this energy, and the ice will never melt. Conversely, if the stars energy output increases for a short while, all the oceans will evaporate and the result would be an irreversible greenhouse-effect, preventing the oceans from reforming. Successful evolution. Even if all of these conditions hold, and simple life evolves (which probably happens even if some of these conditions aren't met), this still does not imply that the result is animal (multi-cellular) life. The evolution of life on Earth included some surprising leaps; two worth mentioning are the move from simple, single-cellular life to cells which contain internal organs, and the appearance of calcium-based skeletons. It appears like the first of these leaps took more time than the evolution from complex single-celled life to full-blown humans. Avoiding disasters. Any number of disasters can lead to the complete extinction of all life on a planet. This include the supernova of a nearby star; a massive asteroid impact (like the one that probably caused the extinction of dinosaurs, and 70% of all other life-forms at the time); drastic changes of climate; and so on. The existence of a Jupiter-like planet in the system. Apparently, Jupiter’s large mass attracted many of the asteroids that would have otherwise hit Earth. Could life evolve in a system with no Jovian planet? On the other hand, too many Jovian planets, or one that is too large, could lead to a non-stable solar system, sending the smaller planets into the central sun or ejecting them into the cold of space. The existence of a large, nearby moon. Apparently Luna, Earth’s moon, is atypically large and close. Both of Mars’s moons, for example, are minor rocks by comparison. What does this have to do with life? Well, it turns out that Luna kept (and still keeps) Earth’s tilt stable. Without Luna, the tilt would have changed drastically over time, and no stable climate could exist. If the tilt would have stabilized on a too-large or too-small value, the results could also be disastrous; Earth’s tilt is “just right”. Plate tectonics. Surprisingly enough, it seems like plate tectonics are required for maintaining a stable atmosphere. Plate tectonics play an important role in a complex feedback system (explained in detail in the book) that prevents too many greenhouse gases from existing in the atmosphere. No other planet (except maybe for Jupiter’s moon Europa) is known to have plate tectonics. Is this a rare phenomenon, but required for life? The bottom line is that many additional factors must be added to Drake’s equation. One must keep in mind that as any term in such an equation approaches zero, so too does the final product. For most terms, we have no way of reliably estimating their true value, but it seems like at least some of these values are extremely low. Two important things should be noted about this book. First, about what it does not contain: although I am sure many people will see the Rare Earth Hypothesis as another proof for the existence of a god, this notion of a proof is completely unrelated to the authors' ideas. The hypothesis claims that the conditions for creating complex life are rare; but we know for a fact that at least in one case, all the required conditions were met. Additionally, anyone who insists on taking the ideas of this book as a proof for god’s existence will also have to accept the authors' prepositions about the age of the universe, the age of planet Earth, and more importantly, the theory of evolution. Second, about what the book does contain: the book discusses at length all the issues I’ve listed above, and more. The problem is that sometimes one gets the feeling that these issues are discussed in too much detail, and the authors tend to repeat themselves, or to delve too deep into some of the less-important aspects of their theory. This is certainly not your common popular-science book; it relies on very up-to-date research results (including some results that were not even published when the book went to press). The writing gets technical on many points in astrophysics, biology, chemistry, and geology (as well as the new field of astrobiology, of course). Over 25 pages of bibliography and references are included. The theory’s weakest point, however, is obvious. The authors admit (after 281 pages of discussion) that their base assumption was that every complex life-form would be similar in many ways to life on Earth: “We assume in this book that animal life will be somehow Earth-like. We take the perhaps jingoistic stance that Earth-life is every-life, that lessons from Earth are not only guides but also rules. We assume that DNA is the only way, rather than only one way” (p. 282). For me, reading this book was a fascinating and awe-inspiring experience. The most important conclusion (apart from SETI being a huge waste of resources) is an unavoidable cliché, which the authors avoided presenting directly, even though it stares into the reader’s face from every page and each paragraph: What we have here is rare, maybe even unique. We should try a little harder to make sure it survives. I just want point out that while the conditions for life on our planet have worked out jsut great for us SCIENTISTS should factor in that perhaps on another planet, with another atmosphere may make for a differnt class of life altogether.. in other words just maybe they shouldnt assume all life needs water and air. also whos to say radio transmissions are the best communications method anyway. for all we know were doing everything wrong when it comes to searching for life..
i probably wont find this page again, and havnt read your whole text - was just looking for an insight into what the RARE EARTH THEORY was.. I think I read enough though. I found this review succinct and informative and definitely food for further thought. There are also two other vital and vast mysteries. How did life develop from non-life? And how did the cell develop? Both these are obvious questions that we can't answer, and the answers are crucial to whether life is rare or common. But, if life is common, where indeed is everybody? I don't expect the neighbours to pop over, the distances in space are truly mind-bending and I suspect travel between the stars just isn't feasible, but, there is no evidence anywhere of other life. Of course, it may be we're looking in the wrong places or not looking in the right way, and, even though, quoting some-one far cleverer than me, absence of evidence is not proof of absence, but surely, there should be something. Surely there should be some vague hint that we are not alone. And as for even mentioning god, why? This is a scientific discussion, and religion has no place in it. Mentioning god is both irrelevant and disappointing.